First, let me touch on Cam Newton's eligibility issue. The NCAA ruled him eligible, which seems like a giant sham because that means that any parent could shop around for their kid, as long as 'they didn't know about it', right? Whatever, it is what it is and I'm actually just sick of hearing his name so I'd rather the issue be settled. But character is often involved in the judgment of a Heisman winner, and if we look at that in this list, only 2/4 players on this list haven't had trouble with the law this year: Kellen Moore and Andrew Luck (James was convicted of strangling his girlfriend). I don't think they have much of a shot, but I'd love to see either of those two win over Cam & LaMichael. Odds of that since their teams are going to the National Championship? Basically none. Also, what if Cam is all of a sudden deemed ineligible if the story develops further? Are we going to have another vacant Heisman year? (Which, by the way, I think was absolute garbage. I think Reggie Bush handled that situation with class and that they should have given it to Vince Young. Everyone still would have remembered the consequences of Bush's actions; it didn't need to stay vacant). I think everyone who has a vote needs to think long and hard about who deserves this trophy. 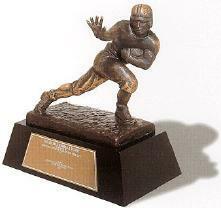 The Heisman Trophy is awarded on December 11th at 7:00pm in New York.